Allied Journal of Environmental Earth Sciences. 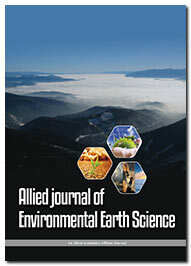 Allied Journal of Environmental Earth Sciences addresses all aspects of geosciences and fundamental understanding of Environmental Climatic Change through the rapid publication of high-quality original research, systematic reviews, meta-analyses and technology reports, perspectives on Earth science and Environment in its speciality. Allied Journal is directed to fundamental practices of Earth Sciences that deals with the origin, structure, and physical phenomena of earth and its parts, effect of disasters etc. The core of the journal is to publish original research, review articles, clinical cases, perspective, commentary and others which provide broad sense of information to the Journal. Allied Journal of Environmental Earth Sciences is an Open Access journal and aims to publish most complete and reliable source of information on the discoveries and current developments in the mode of original articles, review articles, case reports, short communications, etc. in all areas of the field and making them freely available through online without any restrictions or any other subscriptions to researchers worldwide.